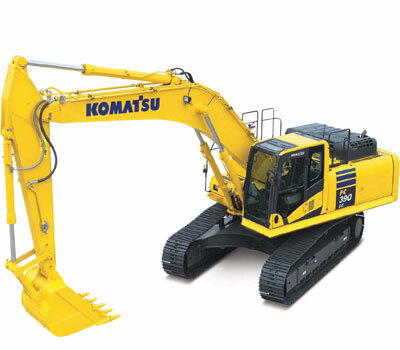 Looking to rent a construction class excavator, Komatsu – PC 390 LC-10 , in Rochester NY, Ithaca NY and Western New York? Industry leading large undercarriage design that substantially increases overside lift capacity and stability. Technologically advanced engine and hydraulic pump technology. Engine: exceptionally powerful Komatsu AA6D114E-5 engine that generates a net output of 192 kilowatts 257 horse power. Bucket Capacity = .89-2.91 cubic yards. Digging Depth = 26 feet, 7 inches. Maximum Reach = 39 feet, 0 inches.